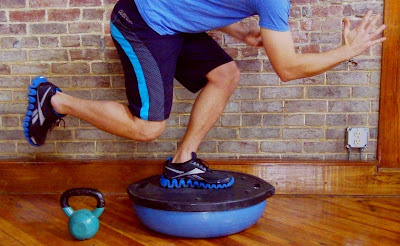 Most people don’t think about incorporating balance training into their fitness regime. This is because they don’t understand the benefits of adding it in. Balance is the ability to control the body’s position, either stationary (e.g. complex yoga pose) or whilst moving (e.g. ice skating). Balance is a key element of fitness, along with strength, cardiovascular exercise, and flexibility. Body awareness is the sense of how your own limbs are oriented in space, also referred to as proprioception. Balance training promotes body awareness which makes movement more seamless, with less likelihood of injury. Balance training requires all of your body to work together otherwise you might fall or stumble. By improving your co-ordination during balancing training, there should be an improvement to your co-ordination in everyday life. Balance training promotes stable knees, ankles, hips, and shoulders. This can prevent a whole array of injuries including sprained ankles and serious knee problems. These injuries are not uncommon in people who don’t do any balance training but do play a sport. If you slip or stumble when carrying out challenging balance exercises your body needs to re-balance immediately or you will fall. This can improve your reaction time as you learn to quickly correct a mistake, but not over-correct. Balance training is challenging for your nervous system (brain and nerves). The nervous system recruits your muscle when lifting weights, so as your nervous system becomes more efficient it can recruit a higher percentage of your muscle for each lift. This means you are stronger and can lift more weight. Power is the ability to exert maximum muscular contraction instantly in an explosive burst of movement. The two components of power are strength and speed. With quicker reaction times and stronger muscles, your power ability should increase too. Agility is defined as quick and nimble. It is the ability to change the direction of the body in an efficient and effective manner and to achieve this you require a combination of balance, speed, strength, and co-ordination. Therefore, the better your balance is, the more likely you are to have good agility. Adding some balance exercises into your fitness routine adds a new dimension, a dimension which is challenging but also fun too. It is motivating when you notice the improvement to the rest of your fitness regime by adding in balance training. Incorporating balance training into your routine helps to maintain or improve your balance, which is needed to prevent falls and fractures. As we get older our balance can deteriorate, something we want to avoid.